The entire sculpture is 13ft high and 3ft 4 inches wide. Each of the four trapezoids are 55 square inches. It moves with the wind and gravity. The sculpture, by George Rickey (1907-2002), consists of four trapezoids that form two rectangles when at rest. It is rarely at rest, as the trapezoids float, turn and move with the slightest breeze. 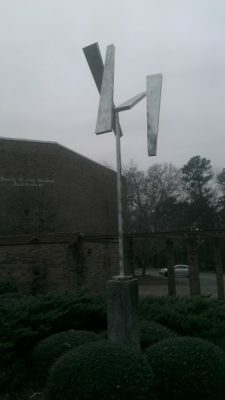 The Museum purchased this sculpture with funds provided by Texprint (GA.), Inc. and Tokai Senko K.K., in celebration of their 10th anniversary in Macon, matched by donations from the Museum Memorial Fund, the Fine Arts Committee, and the artist.